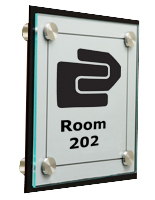 6" x 6" 8.5" x 11"
This custom door sign for room designations lets you take control of its design! 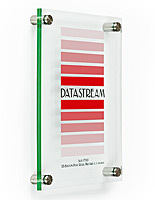 Create your own original business graphics and print them out for wall mount display. 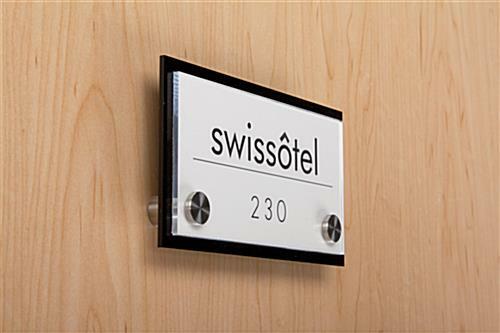 The custom door sign offers a modern appearance that coordinates well in professional interiors. Our do-it-yourself package includes everything you see here to produce an affordable name plate or conference room marker for your business. 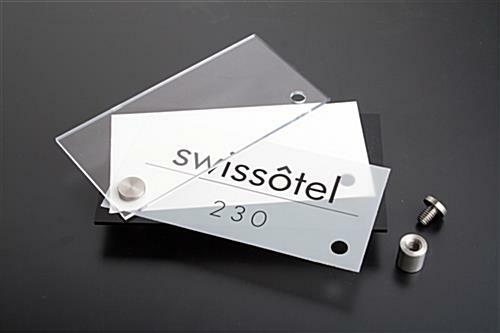 This custom door sign with standoffs is an excellent alternative to other supplier's models, who often charge two to three times as much for a comparable signage display. Simply design, print, assemble, mount, and install! 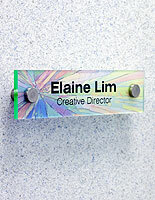 This custom door sign comes with design templates that are clickable below. Once your design is printed, separate the frosted film section from the sheet. 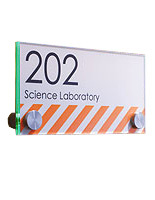 The custom door sign uses a white cardstock backer to ensure your graphics display against a pure white background. Starting with the black acrylic plate, lay down the cardstock layer, then your print, then the clear acrylic face plate. The entire assembly is locked in place by screwing the standoff caps tight. 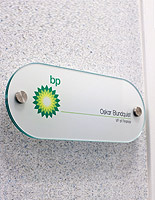 This custom door sign, also called office signs, features a two-tone effect with the black acrylic plate handsomely framing your design. Showcase company logos, room demarcations, suite numbers, whatever you want because you have the freedom to make your own! 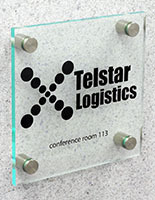 This custom door sign is approximately 6" x 3" and is intended for small signage applications. 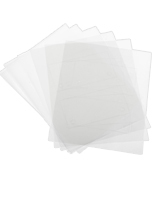 We also include (3) sheets of the printable film to ensure you have enough to get the job done. 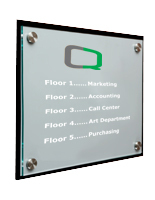 This custom door sign offers the most affordable way to make personalized business signage, buy one today! This is exactly why my client needed for her new office space and I love that you can reprint the inserts or order more as hours/names change and update. Thanks so much for the great review, Kathryn! We hope you shop with us again soon. The product is great and the price is comparable but the shipping on the orders are absolutely ridiculous. You should offer other shipping options at a better rate. Very nice, tidy little kit. SUPER easy to print on the celluloid. Be careful to do a test first. Also, if your background is a solid color, you may want to over shoot the margin marks on the template. That way you will be sure your design covers the entirety, inside the perforated area. Ordering was simple and delivery was very prompt! Thank you for the review, David. Feel free to share your photos on our Facebook page, we love it when our customers show off their products! We also offer additional discounts & deals on our page if you plan on ordering from us again! That's great to hear that you were so pleased with your product, Shelly! And thanks for sharing the photo! Very professional sign, easy to setup, print and install. The only issue we had was the perforations on the film were hard to detach. The instructions were clear but the film just wasn't perforated enough so we had to use scissors which provided a cleaner edge anyway.